Have you ever seen a knitted, crocheted, quilted, sewn or otherwise handmade item that you thought was really awesome but looked much too complicated to attempt yourself? I surely have! Quilts used to intimidate me, especially the binding. Bag making scared me away for a long time before I realized how much creativity could be put into one fabulous bag. Crocheting never really intimidated me, probably because I started it when I was so young. And knitting...well, everything about knitting used to intimidate me. My mother-in-law used to threaten that One Day She Would Teach Me How To Knit! Oooooh, those were scary words! I've told my How I Learned To Knit story here before, so I won't repeat it now, but you can read about it by clicking HERE if you are interested. To sum it up though, it took a tragedy to make it happen! Anyway, over the past many years, I have scoured books, shops, online retailers, blogs and Pinterest for all kinds of ideas for new things to try. 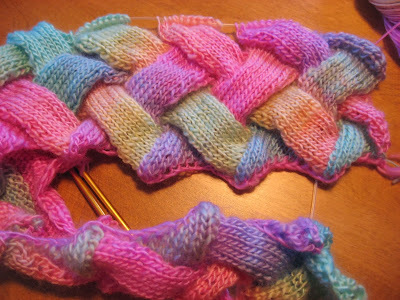 One of the things that intrigued me the most was entrelac knitting. The word entrelac comes from a French word meaning to interlace, so that gives you a little clue as to how entrelac knitting might look. 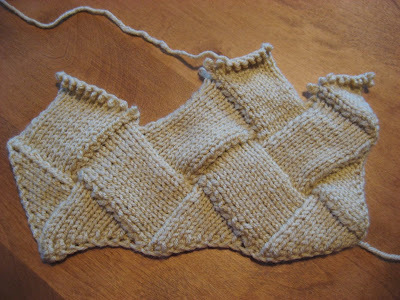 To me, it always looked so very complicated, and not being a real confident knitter for new techniques, I was always just a little too afraid of it to try. That is until I found this awesome baby blanket kit at Mary Maxim, one of my very favorite online retailers for yarny kind of stuff. It was just too amazing to pass up! I had to learn entrelac! Here's my little sample that I worked out just to get the hang of the technique before breaking out the gorgeous yarn that came in the kit. Don't you think this would make an awesome scarf or wrap? You can see the texture that the interlacing technique provides to the piece. 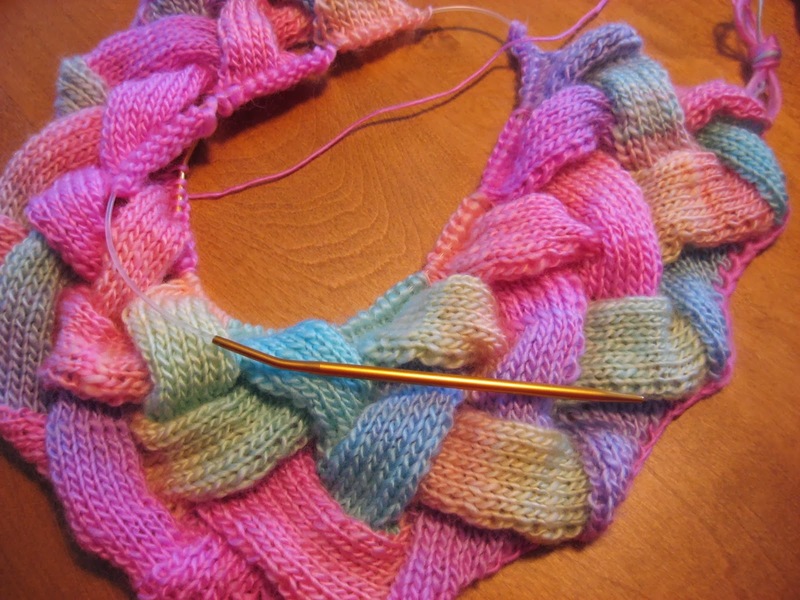 It really does look like there are bands of knitting going over and under each other, but in fact it is just one single layer of knitting. Whoever invented this technique was so very clever! And here is my project in progress using the same pattern as the sample above except that it is the proper width for a baby blanket so there are 10 sections of 10 stitches each for a cast-on edge of 100 stitches. Aren't these colors just so luscious? 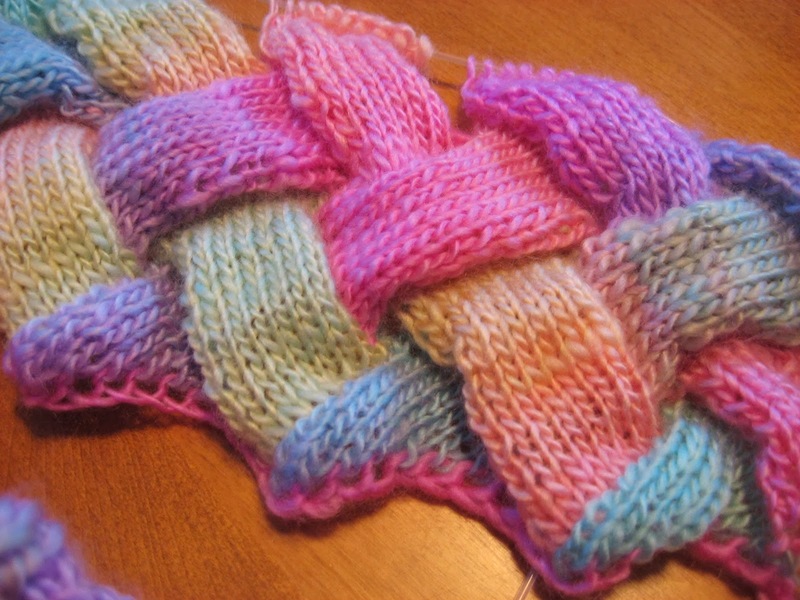 And the texture of the entrelac is so very cozy and inviting! I couldn't stretch out the circular needle to show the piece flat because I'm in the middle of the current row, but you can get a pretty good idea how this pattern is working out, with each pass adding a new layer of either right or left facing strips. 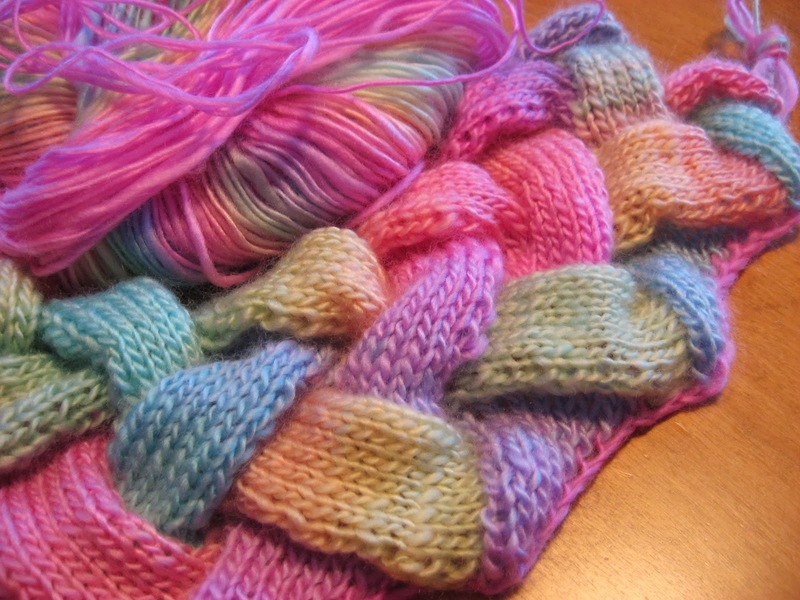 Here you can see some of the yarn ball and the gorgeous colors in this variegated yarn. 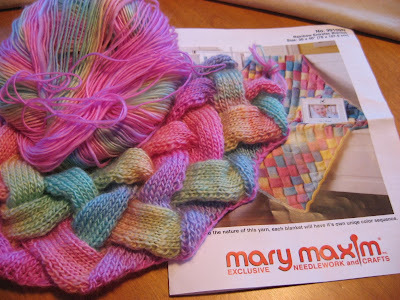 It is Mary Maxim's Prism DK/sport weight yarn in Rainbow, and this pattern calls for 5 balls. I love working with the yarn and the blanket is turning out to be very soft and cuddly. This yarn is 100% acrylic, however it is a roving style yarn so hand washing in cold water and flat drying is necessary. Also because of the roving type of yarn that it is, there are sections of the yarn that are very tightly twisted and thin, and then other sections that are big and fat and fluffy with no twist at all. So if you don't like yarn with varying thickness, this might not be the yarn for you. I was a little worried about it before I started the project, but I'm finding it very pleasant to work with and it is creating a very lovely blanket. So that is my latest knitting adventure using a new-to-me technique called entrelac. This is the project that called to me as I was finishing up my schoolwork for the semester, and now that I am working on it, I am glad I didn't start it until after my finals were over! It is very hard to put down! Between just wanting to finish this one little section, and wanting to keep knitting until the next color change happens, it's a real hard project to stop once I get going on it! If you've ever thought about trying entrelac knitting but have been a bit intimidated by how complicated it looks, I highly recommend that you give it a try. 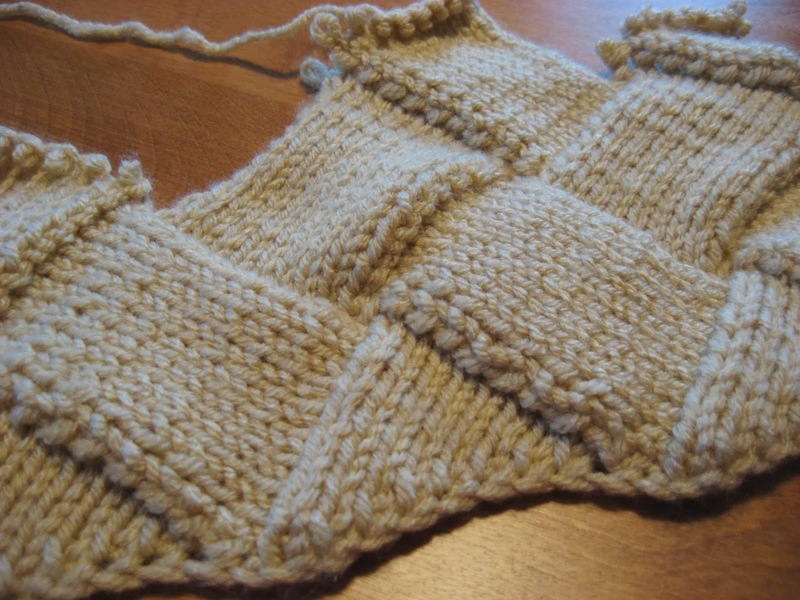 It's made up of knit, purl, simple increase and decrease, and of course following a pattern. It can be done in any increment. This project is done in tens, but I've seen other entrelac projects online that have been done in fours or sixes or even larger numbers. Lots of possibilities with this fun technique! Entrelac is so fun! I just finished a huge project and I LOVE it! Waiting on a good snow to get some outside pix! Your blanket is so pretty! I love this Mary Grace. I have co-worker that just finished a rather large blanket using this method. It is so pretty. I also love your choice of yarn!